For dozens of brands spending big bucks to air advertisements on broadcast television, recent data shows the importance of where and when the 30-second spots air during Super Bowl Sunday. Similar to the touchdowns, it turns out that timing is everything. Dstillery analyzed the activity levels of mobile devices to identify the ads and action on the football field that captured the most attention during Super Bowl 50. The big winners were advertisers that won few kudos from critics, such as SoFi.com, as well as PayPal, Buick, Taco Bell and Snickers. The Dstillery team tracked every second of the Super Bowl broadcast, from 6 p.m. to 11 p.m. EST. By analyzing moment-by-moment ad-calls and mobile activity and comparing it to the week prior, the company's analysts measured events on 100 million mobile devices to determine whether viewers watched ads and other content, such as the halftime show, explains CEO Tom Phillips. Tracking the activity in 10-second intervals, Dstillery determined that when the Super Bowl aired, mobile users were on their device between 10% and 40% less in 10-second blocks of time through the five hours. A running log of when the major game events and more than 80 ads aired reveals that during the fumbles, touchdowns and important moments during the game people used their mobile phone less, and during the advertisements people used their mobile devices more. Half of the top 10 moments that took viewers' attention during the broadcast were non-football events, led by Beyonce's halftime performance, Armed Forces' rendition of "America the Beautiful," and players dumping Gatorade on Coach Kubiak. Viewers engaged with the ads early, and lost interest as the game went on. 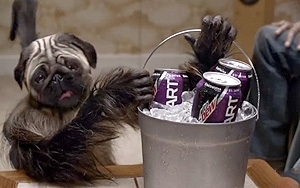 Some 18 of the top 20 most-viewed ads were aired during the first quarter. Jeep Portraits, T-Mobile Bling and Heinz Weiner Parade scored well on some rankings, but drew poor viewership on mobile devices. Phillips says this is because they aired during the late third and fourth quarters. The most-viewed ads ran in blocks, such as those that ran after the first Broncos field goal. Those included Michelob Ultra, Snickers, SoFi.com, Avocados from Mexico. The block with Mobile Strike, Doritos, and PayPal ran after the first Panthers drive. The block with Mountain Dew, Taco Bell and Marmot ran during the review of the disputed first-quarter Panthers catch. Finally, the block with Shock-Top, Buick and Advil, ran after the taunting penalty on Aqib Talib. Stars featured in the ad can help the brand beat the odds if the ad does not run early in the programming, per Dstillery's data. 2 comments about " Mobile Use Sinks During Beyonce, Rises During Super Bowl TV Ads". Ed Papazian from Media Dynamics, February 16, 2016 at 10:47 a.m. Interesting but it would really help if some hard numbers went with the commentaries. For example, mobile phone calls were "10-40% less" during the game. Why not get a real average ---is it minus 21%? Same goes for the other findings. How much higher were mobile calls during an average commercial? Kate Garofalini from Dstillery replied, February 18, 2016 at 6:43 p.m.